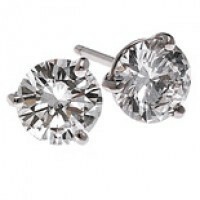 Stock #7001: 14k Solid Gold Charles & Colvard Moissanite 3 Prong Style Stud Earrings. (2 ctw = 1 carat each ear). Classic style fashion necessity! These will come mounted with our Charles & Colvard Moissanite's.